(Amesbury MA) Amesbury had three errors and a wild pitch in the first inning and never recovered from the consequences losing, 7-5, to nonleague Concord-Carlisle on a beautiful Saturday afternoon. Giving up four unearned runs early to a very good Division One opponent was asking for trouble. 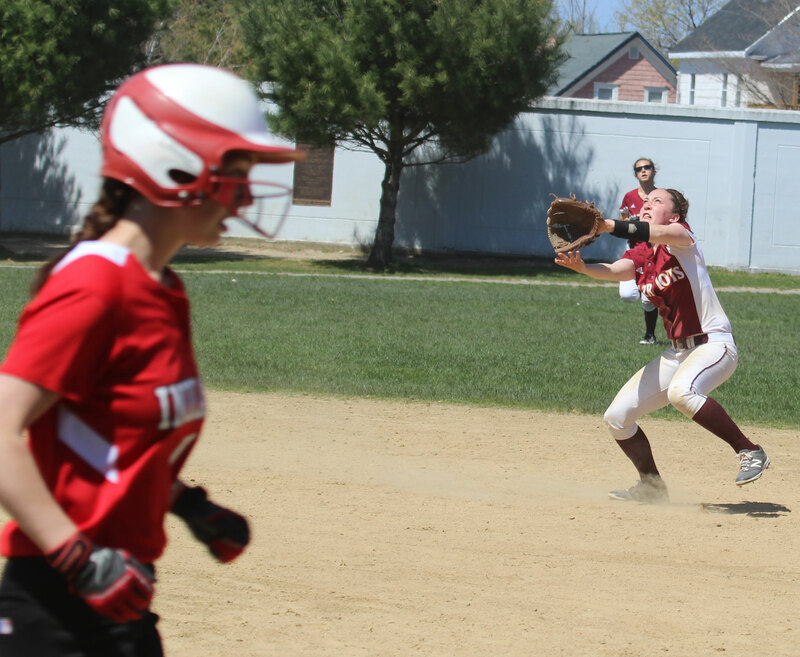 Division Two Amesbury (6-2), despite the defensive start, came out swinging early and often and had home runs (Zoe Fitzgerald, Megan Reid) in the first two innings off CC starter Haley McMorrow. 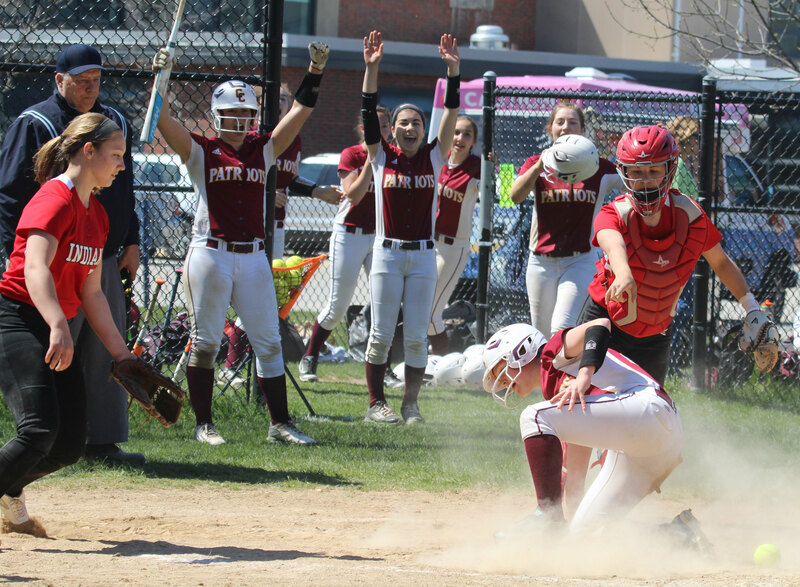 The Patriots (6-3) allowed Amesbury to close to 6-5 in the fifth when they had a defensive nightmare of an inning similar to Amesbury’s in the first. 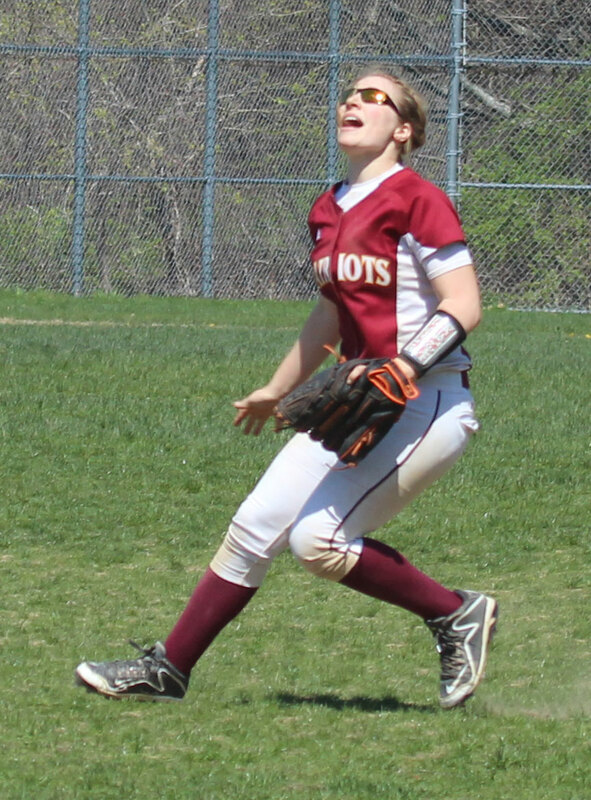 Haley McMorrow, however, was able to end the 5th by getting Maddie Napoli to fly to right with the tying run on second. 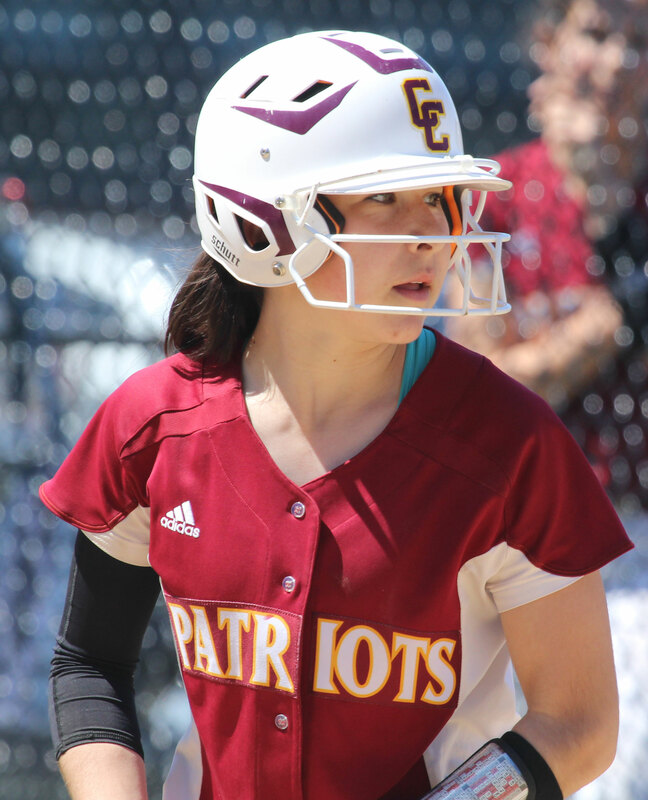 Sophomore Catherine Kingman enabled CC to gain two-run separation in the next inning by whacking a home run over CF Megan Reid’s head. 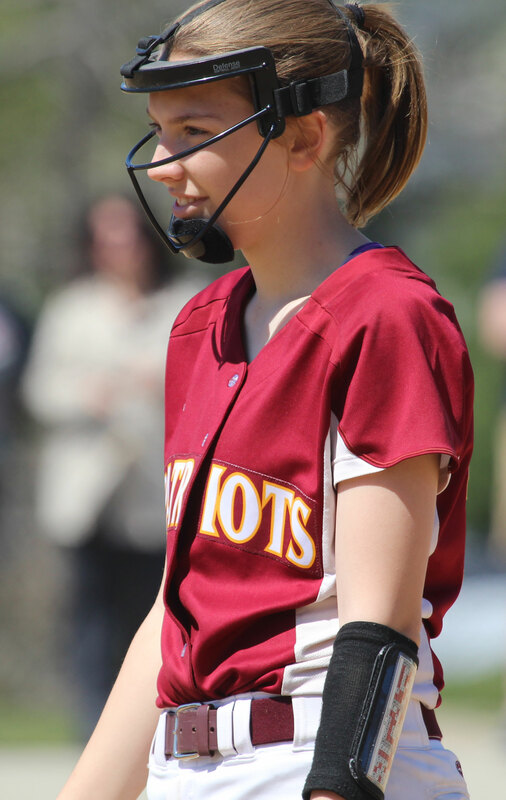 Reliever Nicole Small then came on for Concord-Carlisle and, after giving up a single to the first batter she faced (Caity Baker), retired the last six Indians to seal the deal for the visitors. Good crowd on hand and why not with sunshine and temperatures in the 60’s. Without any outfield fences there was nothing cheap about today’s home runs by Zoe Fitzgerald, Megan Reid, and Catherine Kingman. Both teams had three errors and both teams bunched them into one inning. 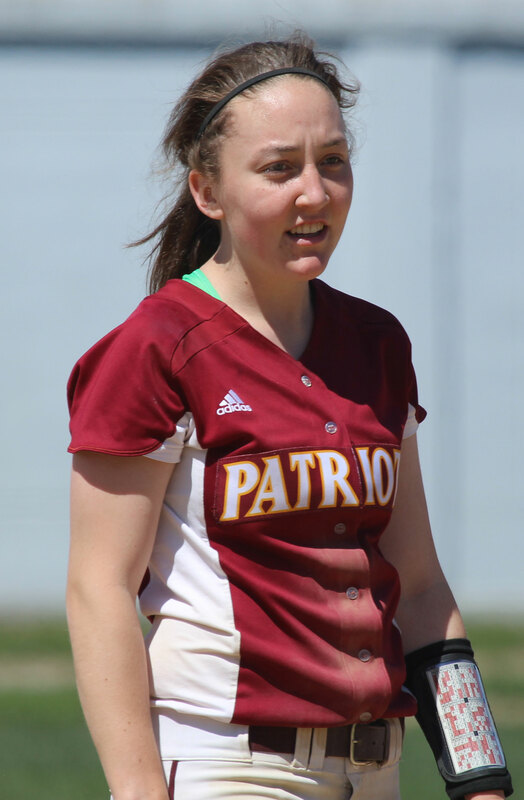 There was a point in the first inning when the Patriots had three runs in and AHS catcher Caity Baker in serious pain at home plate after trying to tag out Virginia Ryan. Things did get better for the home team as they came out swinging with two homers in the next two innings and their defense got better. 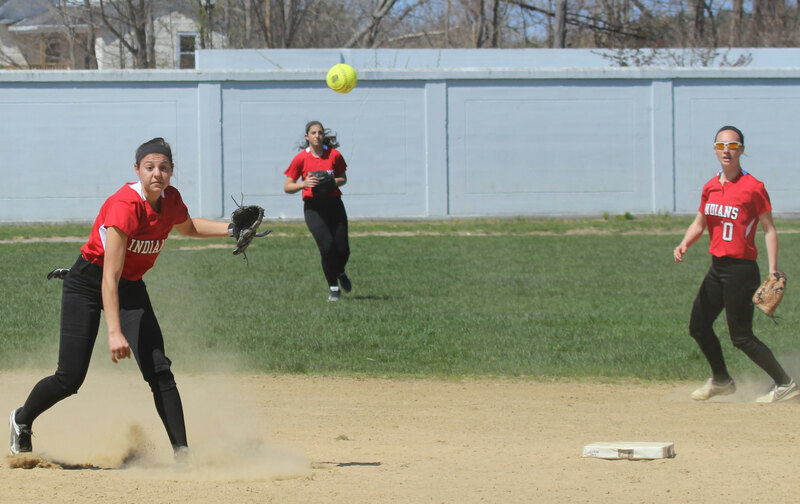 AHS starter Hayley Catania allowed just five hits but had eight walks. Those walks added base runners and helped CC to get single runs in the 3rd and 4th innings. Trailing 6-2, the Indians cashed three runs in their fourth all unearned. The elusive second out was dropped first by LF Audrey McKennitt and later went through the legs of shortstop Scout Boynton. The outfield drop produced a run. 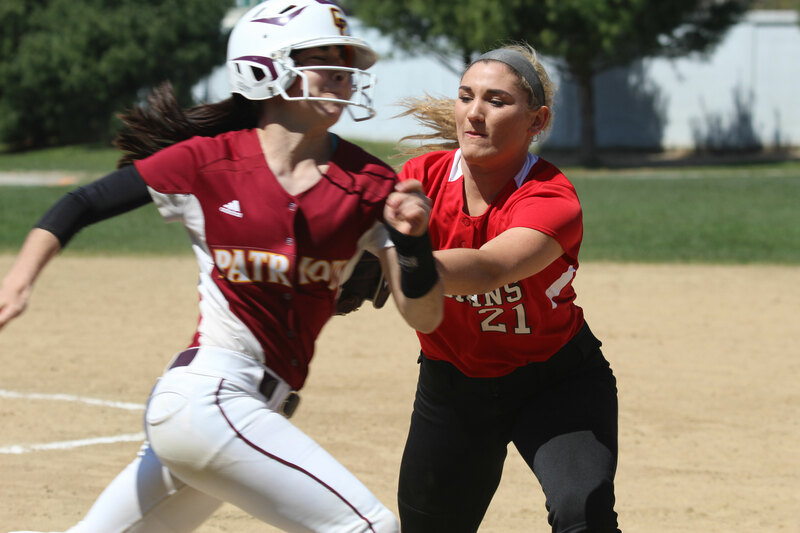 Then with two outs, Lauren Fedorchak’s high infield popup got into the sun for SS Scout Boynton and deflected off her glove for two more Indians runs. In the fourth inning Scout Boynton was on third with one out. On a line drive to right she did not tag up and try to score. The next batter made the third out. 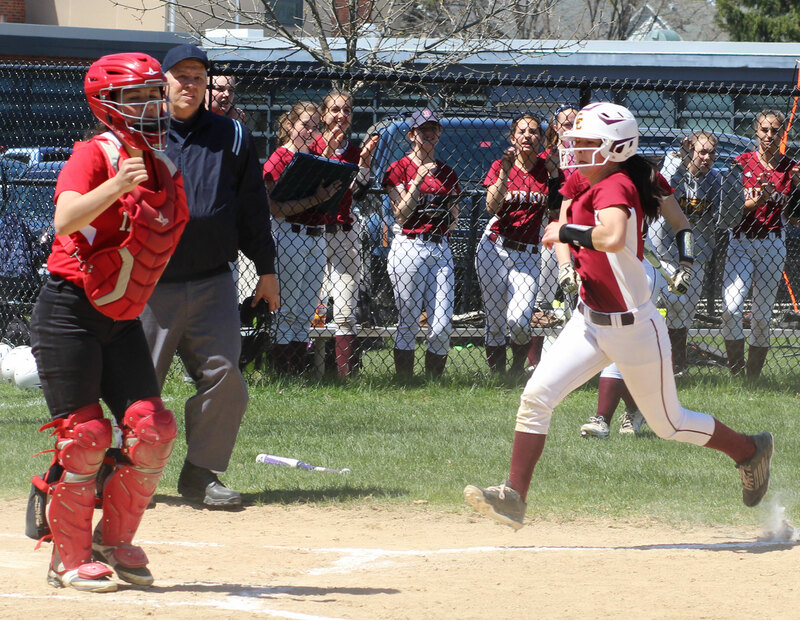 In the second inning, after Megan Reid had homered, Caity Baker tripled. Good relay by CC forced third base coach Jim Hounam to hold Caity at third. 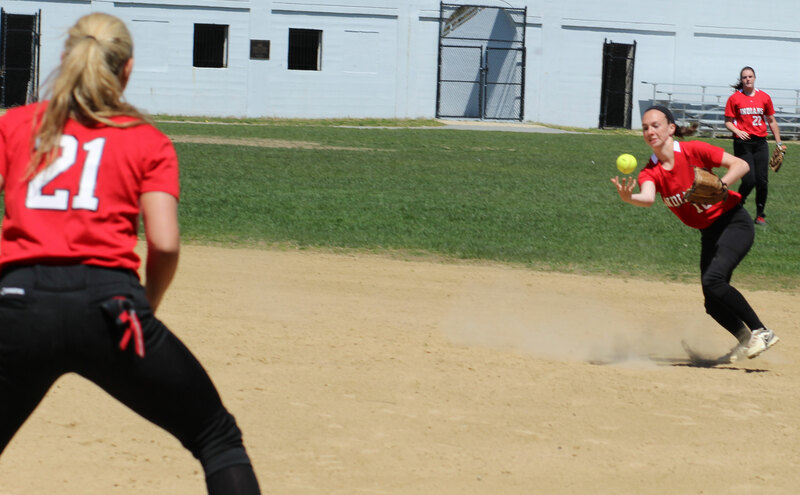 Starter Haley McMorrow then retired three straight and Amesbury was only able to get one run out of a very promising inning. Concord-Carlisle is from the Dual County League and have been a powerhouse in that league the same way Amesbury has been in the Cape Ann League. There will be a rematch between the two teams on Saturday May 21st at Concord. 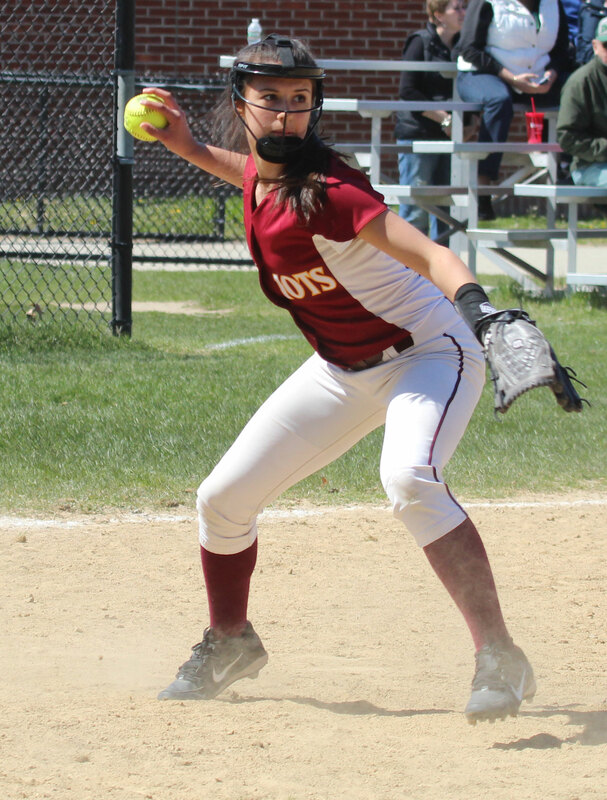 Emma Della-Volpe was the co-MVP of the Dual County League in 2015. She was 8-1 with 105 K’s in 97 innings pitched. 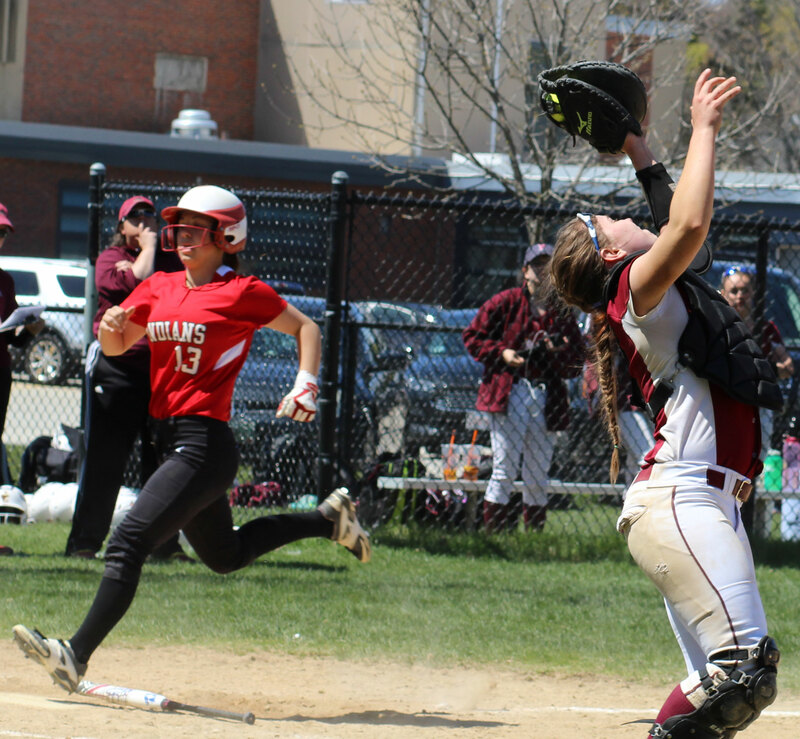 Amesbury can be thankful that CC’s four games in six days kept her away from them this time. 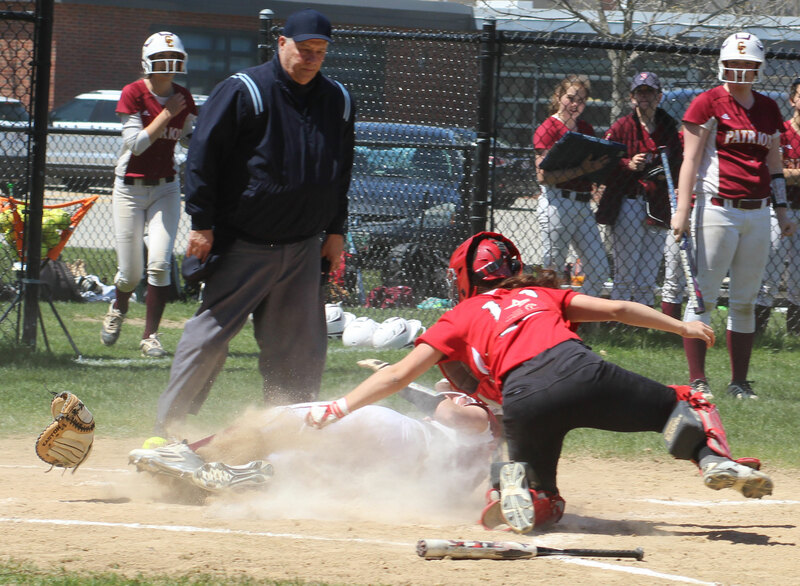 Amesbury will be facing Lynnfield on the road on Monday afternoon. The Patriots visit Bedford tomorrow afternoon. Modern equipment: You watch football and see armbands. Now softball teams have them. They have numbers on them and coaches use them for offensive and defensive situations. So a coach yells out a number and all the players look at their armbands. It will be very hard to miss a signal under this arrangement! One coach in my (very) distant past would yell things like, “This is your existential moment.” He taught philosophy. It was good to see Augie the Amesbury mascot on hand.